Over the years we’ve produced millions of asset tags. These are some recent examples of actual AllianceTag asset tags. 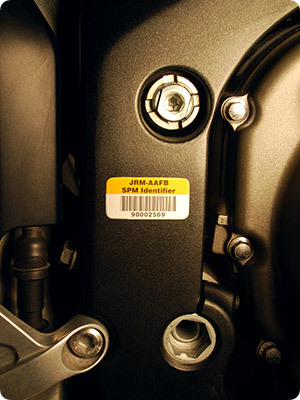 Asset tags are commonly affixed to equipment, tools, fixed machinery, and infrastructure. With powerful adhesives and a very low profile they fit snug and flush on a variety of surfaces. You can get free samples or design your own tag. 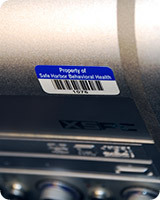 It’s common to see AllianceTag asset tags on computers, printers, monitors, furniture, vehicles, medical equipment, military hardware and high-speed production equipment. They’re often attached to shelves in warehouses and boxes in storage rooms, on documents and folders and on the filing cabinets too. At job sites AllianceTag asset tags help track power tools and construction machinery during long-term projects. Mobile business electronics such as laptops and cellular phones also use asset tags to log who is in possession of the device and where the asset is going to. Both aluminum and polyester tags are flexible and will fit to curved surfaces. You can create any imaginable design. Include your logo, special graphics, or barcodes like Code 39 (3 of 9), Code 128 or Data Matrix. Choose from standard colors or a wide array of custom colors including Pantone colors. We can also closely match your logo or brand colors. You can also use custom number sequences or include a phone number or address. It’s your call. For Complete Customization, Call Us! One phone call and you can have exactly what you want, and quickly too! We’re here to help. Call us at (858) 549-7297. A division of Express, worldwide identification industry leader over 30 years. Millions of tags and labels sold. Satisfaction guaranteed! › Vinyl, Polyester or Aluminum Asset Tags?